WHY DO MOST WINE ENTHUSIASTS SUGGEST A WINE AERATOR? The essence of red wine is enhanced when allowed to breathe. A wine aerator filters air through the wine by allowing the contents to aerate. This ensures a smooth taste and fuller body. A wine aerator saves time. No need for you to wait 30 minutes for your wine to aerate in a decanter. WHY THE BEST HOME PRODUCTS WINE AERATOR? - The Very Best Wine Aerator instantly enhances the bouquet of both expensive and inexpensive red wine. - It expands the aromatic profile and highlights individual smells, flavor and finish. 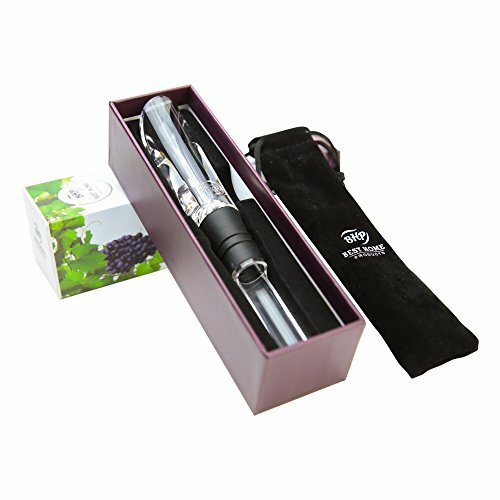 - VeryBest Wine Aerator is designed as a top of the bottle spout/pourer. - Insert into the bottle. Pour. Enjoy! - Hold the bottle not the wine aerator! - Provides a dripless pour. - It makes a great gift! We are so confident that you will absolutely LOVE the Very Best Wine Aerator that we provide a no questions asked 100% guarantee. ★ The Connoisseur's Choice! ★ Air Your Wine or Liquor As You Pour. Portable size makes it easy for travel. Take with you to your favorite restaurant. Hassle free - NO STANDS - Use anywhere, anytime. Hold onto the wine bottle, not the wine aerator! SIMPLE TO USE. Enhances the bouquet and flavor of any red wine instantly. ★ OUR COMMITMENT TO YOU ★ Comes with a 100% Money Back Guarantee. We will fix any problem quickly and to your satisfaction every time! Our motto is to treat our customers as we wish to be treated. If you have any questions about this product by Best Home Products, contact us by completing and submitting the form below. If you are looking for a specif part number, please include it with your message.